According to a District Department of Transportation analysis, D.C.'s single most-dangerous intersection is located along a busy bus corridor and near a Metro station. See a map of the D.C.'s worst intersections. WASHINGTON — D.C.’s most dangerous intersections span all four quadrants of the city and often have lots of pedestrians. 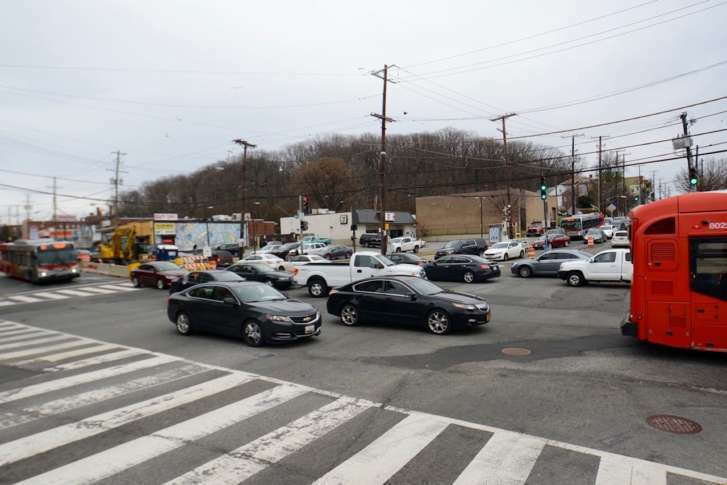 According to a District Department of Transportation analysis focusing on severity, frequency and rate of crashes, Minnesota Avenue and Benning Road Northeast was D.C.’s single most-dangerous intersection in 2017. Minnesota/Benning is located along a busy bus corridor, near the Minnesota Avenue Road Metro station, and involves two roads with lots of traffic. Medium-range plans there call for changes as part of the DC Streetcar extension to the Benning Road station, but it is an intersection that has long had problems. Next on the list are New York Avenue and Bladensburg Road Northeast and the busy intersection of 14th and U streets Northwest. The area immediately in front of Union Station in Northeast D.C. and the intersection of Firth Sterling Avenue and Howard Road Southeast — near the Anacostia Metro station — round out the top five. New York/Bladensburg had more car crashes than any other intersection in the city — 126. First Street and New York Avenue Northeast was second with 97. Fairlawn and Pennsylvania avenues Southeast — the exit from D.C. Route 295 onto Pennsylvania — had 94. In the U Street corridor, cars hit nine people walking at Ninth and U streets Northwest more than at any other single intersection in D.C. Six people each were hit at Connecticut Avenue and N Street Northwest; the area in front of Union Station; at 16th Street and Kalorama Road Northwest; and at 17th and I streets Northwest. The highest raw number of crashes involving bicyclists were at intersections in Northwest D.C., including 14th Street and Wallach Place near U Street; 13th Street and Pennsylvania Avenue Northwest, near Freedom Plaza; Seventh and I streets; 16th Street and New Hampshire Avenue Northwest; and First Street and Florida Avenue Northwest. See the locations of D.C.’s most-dangerous intersections in the map below.